Come for delicious breads and pastries, handmade pizza baked in a wood-fired oven, handmade kitchen wares, Artisan halvah, maple syrup, jams, butter, cheese, the best books and equipment for baking at home, professional bakers to answer your questions, live music, beautiful kitchen linens, demos, and superb Maine made foods. The Maine Artisan Bread Fair is one of a kind. It is a fair dedicated solely to Real Bread and everything associated with this most ancient and central staple. 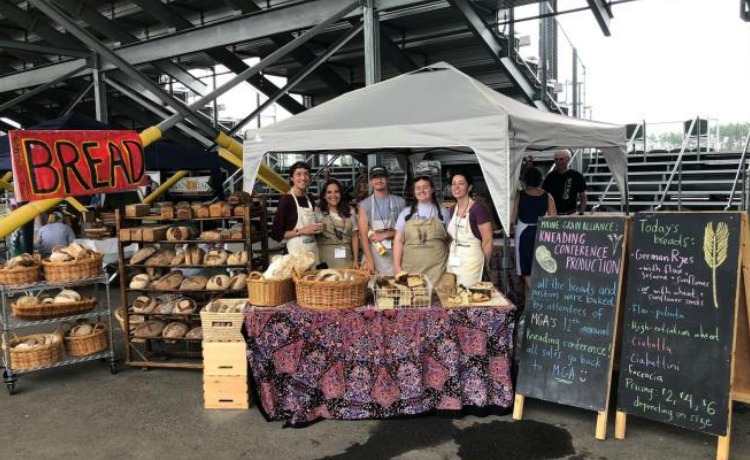 The Maine Grain Alliance has sponsored the Bread Fair for seven years and the offerings have grown each year. Demonstrations range from bread baking using sourdough (with starters to take home!) to tortilla making. A children’s area will be expanding this year- kids can make (and cook and eat!) their own pizza, play with dough, and lots more. While you will be captivated by the wares in each booth, you will also be able tantalize your taste buds as you sample foods ranging from pizzas cooked in wood-fired ovens to tacos in tortillas baked fresh on-site, sweet pastries, and a variety of other locally produced delicious food.